Not ready yet to give up on those simple and healthy recipes with taro, or sato imo/里芋 as they are called in Japan that should please my vegan and vegetarian friends (omnivore friends, just be a little more patient!)! It is another very simple dish that should provide food with a filling sensation to vegans. -Peel taro/sato imo and cut into bite-sized pieces. Cut bamboo shoots in approximately size (if needed). Cut the konnyaku/devil’s tongue tuber in slightly smaller pieces. -Boil the Taro/sato imo a little beforehand to soften them. 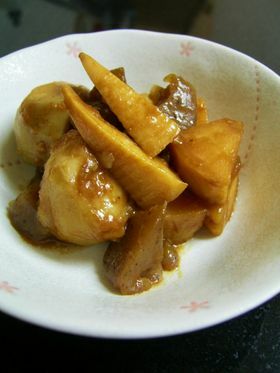 -In a pan drop the half cooked taro/stao imo, bamboo shoots and konnyaku. Pour dashi until dashi until it had submerged everything. -Add sake, mirin and salt and bring to boil. Lower fire to low~medium and simmer/stew until soup/stock has disappeared. -Once the soup has disappeared, a frying sound will be heard. At that moment add the oil and stir fry the lot. -Once the oil has coated everything, add the miso and mix gently as the taro will be soft by then. -Add the yuzu koshio/Lime and chili pepper mix just before serving. This looks and sound really simple to me. I can attempt this! YAY! I think I should be able to get all the ingredients.